Bridle Path at Devil's Dyke Leading into Poynings, c. 1905: Devil's Dyke is a deep valley 5 miles north-west of Brighton, crowned by an Iron Age hill fort. The area has been a popular destination for visitors from Brighton and Hove since at least the early nineteenth century, and there has been a succession of hotels there since 1831. This view shows a bridleway leading to Poynings, a village in whose parish Devils Dyke lies. Devil's Dyke Aerial Cableway, c. 1900: Aerial Cableway over Devil's Dyke which operated c. 1894 - 1909. 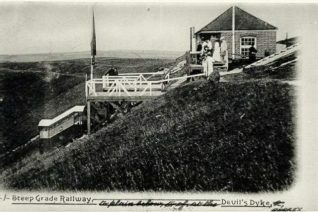 Steep Grade Railway at Devil's Dyke, c. 1900: Postcard of the steep grade railway at Devil's Dyke. a) HISTORY: The Devil’s Dyke is a deep valley in the Downs to the west of Saddlescombe and five miles north-west of Brighton in the parish of Poynings. The adjacent hill has no particular name of its own, but is crowned by an Iron Age hill fort and, at 711 feet above sea-level, has magnificent views over the Weald. The legend of the Dyke is widely known: it is said that the Devil dug the chasm to allow the sea to inundate the churches and pious inhabitants of the Weald, but an old lady, on hearing the noise, lit a candle and Ol’ Nick, believing it to be the rising sun, left his terrible work unfinished. In reality the 300-foot-deep valley was carved by tremendous amounts of water running off the Downs during the last Ice Age when large amounts of snow thawed and the frozen chalk prevented any further absorption; erosion was aided by the freeze-thaw cycle and the valley was deepened by the ‘sludging’ of the saturated chalk. In April 1928 Brighton Corporation, through the initiative of Herbert Carden , purchased 190 acres of downland in the area for £9,000. It was dedicated for public use by the Duke and Duchess of York on 30 May 1928 when a commemorative seat was unveiled; the inscription reads ‘God gave all men all earth to love’. The Dyke has always been a popular resort for Brightonians and there has been a refreshment building of some sort there since 1818. The first hotel building, designed by George Cheeseman, was erected in 1831 but replaced in 1871; the second hotel was burnt down in 1945 and the present structure built in 1955. 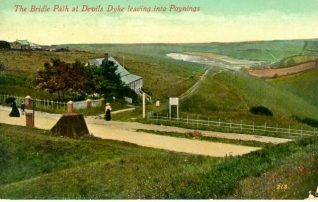 Tourist attractions at the Dyke since the late nineteenth century have also included a funfair, bandstand, observatory, camera obscura and coffee rooms. 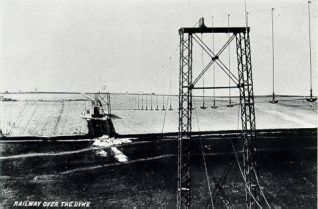 Both William IV and Queen Victoria visited the Dyke while staying at Brighton. I lived in Hangleton during the 1960s and it was a Sunday treat to walk up the route of the railway to the Dyke. We would look at the zoo there – does anyone else remember that? I think it was only a wallaby and a tortoise. Then an ice cream from the shop and, if we were really lucky, a trip on the open top bus (was it a 17?) to the Steine and then a Number 5 home. Can’t remember the last time I went up there. My children would be unimpressed by the simple pleasures we had. The name ‘Devil’s Dyke’ comes from a local legend in which the devil was so enraged by the number of churches being built in the weald that in the dead of night, he began to dig a huge gully all the way to the sea to flood it. The story then tells of an old lady who heard the noise which resulted and took a lamp to investigate. The devil fled at the sight of the light mistaking it for a holy force, leaving the job half done. 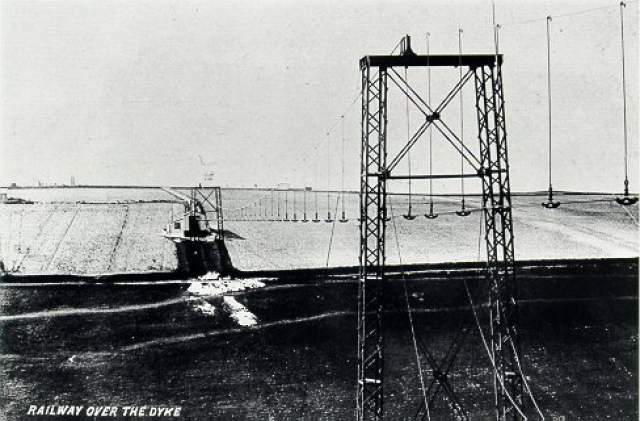 The dyke was in fact carved out by a vast volume of rushing water and debris at the end of the last ice age when great amounts of snow and ice melted as the temperature rose. I dont think this is the Aerial Cableway. 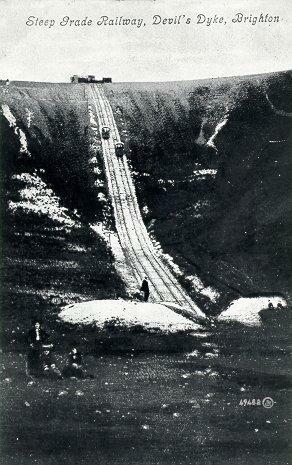 I think this is the steep grade railway (as it says on the card) that ran down the side of the Dyke to Poynings. The foundations of the platform are still visible and the depression in the ground that the rails made are still clear to see. I vaguely recall cycling to the Devils Dyke with my mates soon after the war (1946-8?) and being told there was a skeleton of a whale (yes, a whale) there. It was just behind the hotel and in, or on the edge of, the woods there. I have related this to my grandaughters, who now think I have a screw loose, I have searched high and low, been on to various websites, and the Booth Museum. They were very helpful and told me of a whale that was washed up on the beach locally, but nowhere can I trace the ‘Devils Dyke’ whale. Anyone out there know anything, please make a comment. Oh, by the way, I saw it with my own eyes! You may have seen my comments recently on a skeleton of a Whale on the Devils Dyke. My grandaughter has now come up with some information, which she discovered in a book called ‘The Cambridge Natural History’ by Frank Evers Beddard M.A. (Oxon), Vice Secretary and Prosector of the Zoological Society of London, published in 1902. As it is a rather large tome, I will just quote the relevent article Chapter X11 page 359. ‘The Greenland Whale is absolutely confined to the Arctic Ocean and reported occurrences on our coasts are due to a confusion with B.Australis. At the ‘Devils Dyke’ near Brighton, there is, or was, the skull of a most flagrant Eorqual, which is carefully labelled ‘Greenland Whale’.’ This must have been there at the turn of the 20th century. I just wonder if it was still there in the late 40s, when I thought I saw it. The whole book is published on the web if anyone is so interested. I’m sure there was a small animal zoo park at the Dyke and will ask a family member to look out some photos. During the 1960s when we first came down to Brighton we used to get an old touring bus or something from the Old Steine upto the Dyke. Then Mum took us to see the animals which were mainly small animals like goats in some pens near the hotel. If you Google Nigel Emery’s Gallery of Devil’s Dyke, there is a photo of the whale skeleton, and a great poster advertising both the Great Cable Railway, and the Steep Grade Railway.